B-17's release their bombs on a flare from pathfinder aircraft. Cloud cover over Europe made visual bombing impossible. Radar led bombing changed that. Radar, sometimes referred to as the "invention that changed the world" is a system that uses electromagnetic waves to identify the range, altitude, direction, or speed of both moving and fixed objects. The term RADAR was coined in 1941 as an acronym for “Radio Detection and Ranging. The term has since entered the English language as a standard word, radar, losing the capitalization in the process. Radar was originally called RDF (Radio Direction Finder) in Britain. In its simplest form, a radar system has a transmitter that emits radio waves that are reflected by the target and detected by a receiver, typically in the same location as the transmitter. Although the radio signal returned is usually very weak, radio signals can easily be amplified. This enables radar to detect objects at ranges where other emissions, such as sound or visible light, would be too weak to detect. The first to use radio waves to detect “the presence of distant metallic objects” was Christian Hülsmeyer, a German Physicist who in 1904 demonstrated the feasibility of detecting the presence of a ship in dense fog. Radar was invented in 20th century and had been in existence three decades before the start of WWII. Its major developments happened during World War II as each country particularly Germany, Britain, and the U.S. understood the strategic importance of radar as an offensive and defensive weapon. It was the British who were furthest along in the development of radar and who contributed most to its military development. Radar had many uses during the war mainly due to its ability to detect objects: this fact was utilized by ships, aircrafts and ground forces. Radars were mounted on ships and used to aim anti-aircraft guns due to its high accuracy. Ships also used radar for navigation during night and heavy fog conditions. Aircraft also used radar to aim at ground based targets. (the primary focus of this website) Ground based radar however, was also used. They could be used to detect enemy aircraft Also during the war; meteorologists in the military recognized the use of radar to track storms which ensured the safety of military aircraft and ships. Winston Churchill knew that Britain needed American scientific, engineering, and manufacturing resources to win the war. He decided to unconditionally share the major development in the history of radar which was the British invention of the cavity magnetron by Randall and Boot of Birmingham University in early 1940. This was a small device which generated microwave frequencies much more efficiently than previous devices, allowing the development of practical centimetric radar. At the beginning of August 1940, Churchill authorized Tizard to form a team to take Britain’s most promising new technologies and demonstrate them to the Americans. The Tizard mission was a party of seven, including Tizard himself. Loomis, Bush, and other NDRC officials realized that a civilian research lab had to be set up outside of military control, using NDRC funding, to ensure that cavity magnetron technology was developed and deployed as quickly as possible. It was the cavity magnetron which would allow the development and deployment of the of H2S "Stinky" and H2X "Mickey" radar units that would lead to the establishment of Bomb Through Overcast (BTO) and the Pathfinder Forces (PFF) of the 482nd Bomb Group. As the U.S. 8th Army Air Force continued its build up in England during 1942 and 1943, it became obvious to VIII Bomber Command (BC) that the success of an offensive strategic bombing offensive would be contingent on the ability of the VIII BC to operate above the weather and bomb through overcast. In December of 1942 the VIII BC had an average of 72 heavy operational bombers available to strike at enemy targets. The weather in Dec of 1942 did not permit one operational day and the first 15 days of January 1943 did not allow the 8th to complete a mission. England and Western Europe experienced a storm on average every three days. In addition, fog and low hanging clouds created early morning delays and challenges in aircraft forming up over England for the trip across the channel. It was a very complex problem for VIII BC. 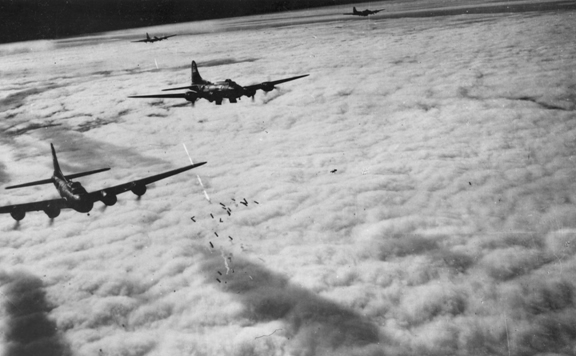 Estimates by 8th Army Air Force Meteorologists suggested that visual bombing opportunities against targets in Germany would exist on average between 20 and 30 % of the time. Ira Eaker, commanding General of the 8th Army Air Force, proposed that there were only 75 days per year where the weather would ground all aircraft. What was needed was the ability to Bomb through Overcast (BTO) on days when visual bombing was not an option. The U.S. 8th looked to the British who had developed "Oboe" and "Gee". Although both Oboe and Gee would become very effective navigational aids they did not solve the problem of BTO as the Germans had discovered ways to jam them and their range was limited during day light hours. Eaker turned instead the British H2S "Stinky" unit. In March of 1943 Ira Eaker formally requested the RAF for eight H2S units for installation in 8th Army Air Force B-17’s. In March of 1943 four radio mechanics and two officers were sent the British Telecommunication Research establishment (TRE) at Great Malvern to learn about H2S Radar. That same month B-17 F # 42-5793 was sent to RAF Deford for installation of H2S. It was with that first H2S installation that America’s Army Air Force entered the radar age. The scanner and radardome were placed under the nose and was shielded by a bath-tub shaped plastic cover. 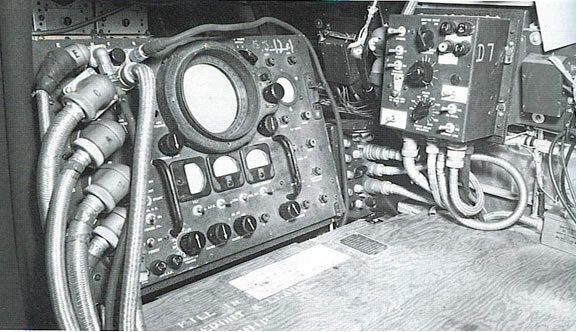 The radar scope and navigation unit was placed on the left side of the navigator’s station and required some equipment movement. The radar units were found to be temperamental during early test flights. With patience hard work and reseilinancy the first Pathfinder equipped aircraft were about to lead their first mission. B-17 equiped with British "Stinky" radome under nose. H2S Stinky was the RAF’s primary air to ground radar system utilizing a 10 centimeter frequency for airborne terrain scanning radar. 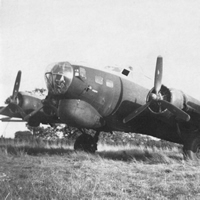 It was developed for the RAF bomber command and was utilized on the Halifax, Sterling and Lancaster bombers. Command for night time bombing of German targets. The H2S set transmitted energy through a high frequency electrical energy impulse downward through a revolving antenna; these impulses were reflected back to the aircraft and converted the images to a cathode ray tube. The reflections on the scope would allow the specially trained H2S operator to determine contrast between land, water and cities. H2S could be used at 25,000 feet and had a 50 mile radius. Designed at the famous Massachusetts Institute of Technology (MIT) – H2X radar was the American version and an improvement upon the British H2S unit. H2X utilized a 3 centimeter micro-wave versus the British 10 CM. Often referred to its official designation of the AN/APS-15. It was more commonly known as "Mickey". The first 12 H2 X set was installed on one B-17 F model and the remaining eleven were installed on the newer B-17 G equipped with a chin turret. The installations took place in Rome, NY and the unit was placed in under the nose similar to the H2S in placement. The H2X was semi retractable and cylindrical in shape. It was Major Fred Rabo who was responsible for bringing the first 12 B-17’s equipped with H2X back to Alconbury. Major Rabo arrived in Alconbury on September 21, 1943 with the first H2X B-17’s. B-17 with H2X, "Mickey", radar. In 1942 and 1943, it became evident that a major problem in completing 8th Bomber Command missions to Europe successfully were the poor weather conditions existing over England and Europe, especially in the winter months. Before WWII started, Gen. Hap Arnold had stated that the U.S. Army Air Corps needed a way to carry out bombing missions in bad weather conditions. H2X – Mickey Unit – Located opposite the radio operator station. 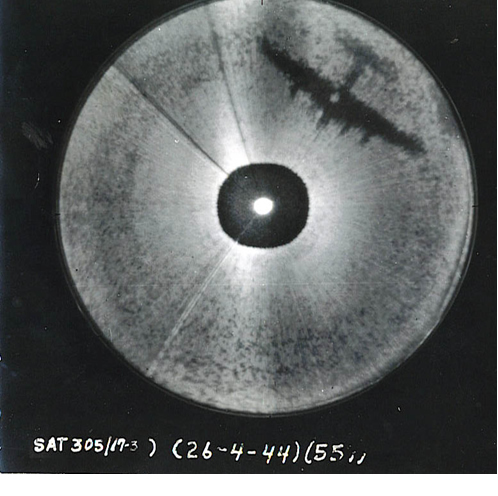 Actual H2X Radar Scope shot from April 4, 1944. Note the B-17 clearly visible to the radar operator below his aircraft.